Months before the release of his Blood Sutra in 2003, pianist Vijay Iyer and his quartet premiered music from the album in a concert commissioned by the Jazz Gallery (then still on Hudson Street in Lower Manhattan). Iyer had developed a generative rapport with drummer Derrek Phillips on past projects, but Phillips was no longer in New York. The gig went to an up-and-comer, a Newark, New Jersey native and undergraduate at William Paterson University named Tyshawn Sorey, who completed the Blood Sutra lineup with Rudresh Mahanthappa on alto saxophone and Stephan Crump on bass. Sorey stunned listeners that night with his raw, inventive rhythmic approach and gale-force chops. But few people, perhaps not even Iyer, were yet aware of the breadth of Sorey’s talent. Iyer also knew of Sorey’s trombone playing, “which equally caught me off guard with its fluidity and clarity. As a performer [Tyshawn] could have chosen any one of these paths, to great success.” In a sense, he’s chosen all of them. It’s something to see: A fired-up young sideman blossoms into one of the most multifaceted and restlessly evolving artists of our time at age 36. It’s hard to tally just the most recent accomplishments. In February at the Ojai Festival in California, Sorey, on piano and drums, premiered a work commissioned by the International Contemporary Ensemble (ICE) called Perle Noire: Meditations on Josephine, a Josephine Baker-inspired song cycle in collaboration with famed opera director Peter Sellars, soprano Julia Bullock and poet Claudia Rankine. Another ICE commission is now in the works. Meanwhile, Sorey’s Alloy trio with pianist Cory Smythe and bassist Christopher Tordini has played weeklong stints at the Village Vanguard. 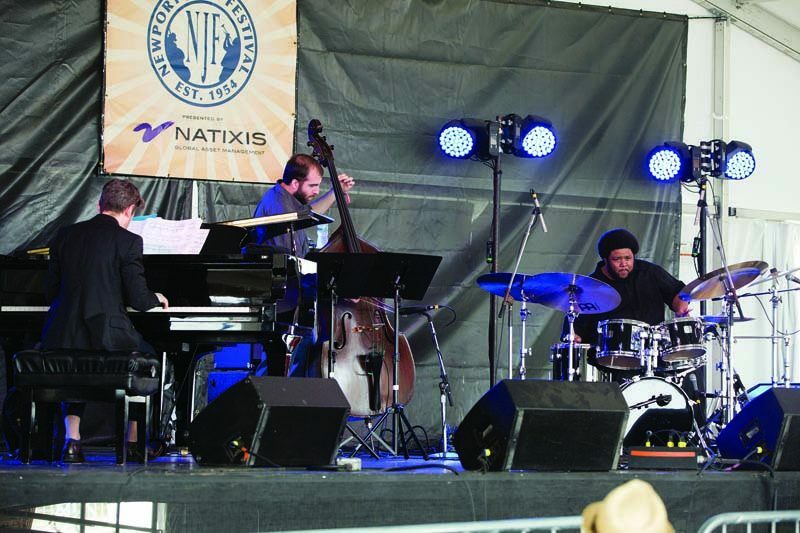 In late July, the same trio premiered a work commissioned by the Newport Jazz Festival that Sorey plans to release soon, along with material from the Vanguard run. Sorey also appeared at the Vanguard in no less than three different bands, including a stupendously thrashing quartet led by trumpeter Peter Evans, during John Zorn’s Bagatelles week in mid-August. Sorey has perfect pitch and something close to a photographic memory; his associates all have stories about him being handed a complex chart, looking it over and then not even using it on the gig. 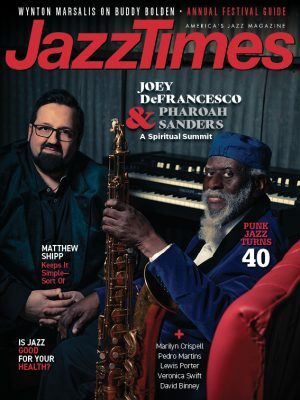 A gift like that may have accelerated his progress, but his omnivorous aesthetic and high-level jazz sensibility evolved through contact with great teachers, both at William Paterson and the New Jersey Performing Arts Center (NJPAC), including John Riley, Mike LeDonne, Michele Rosewoman, Bill Goodwin, Kenny Washington, Billy Hart, Ralph Peterson and Harold Mabern. Interestingly, Sorey started at Paterson as a classical trombone major. “I was playing brass quintets, playing with the college orchestra, playing solo repertoire and stuff like that,” he says. 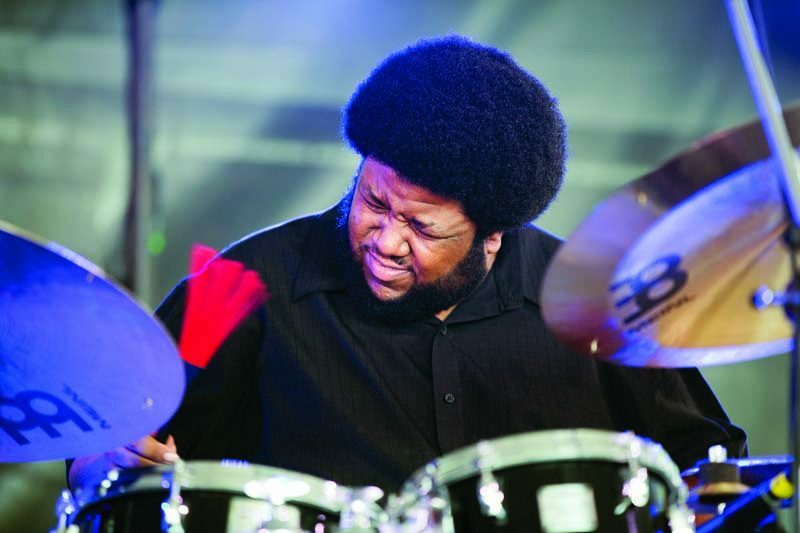 But he switched and began to seek his place in the lineage of drummer-composers, including underappreciated ones like Freddie Waits and Joe Chambers. In part it was his interest in composing that led him to Wesleyan, where Braxton and others led the way toward a “trans-idiomatic” viewpoint. At Wesleyan Sorey also explored Japanese taiko drumming, music of Ghana and Togo, Klezmer music in an ensemble led by his future wife, and on and on. When he began his degree work at Columbia, however, he wasn’t as comfortable at the start. “I was trying to appeal too much to people in the program, to a certain ideal that I felt Columbia represented, which I was completely wrong about,” he says. “Because in fact it’s much more open than I thought.” George Lewis and Chris Washburne, two fellow trombonists, helped him find a foothold. But it was esteemed composer and music theorist Fred Lerdahl who gave Sorey a “third eye” in regard to scoring and form, rekindling his love for the tonal classical music he once taped from the radio as a kid. Already on his 2007 double-disc debut, That/Not, Sorey made clear his interest in music that went well beyond the drums. Disc one includes a 42-minute Morton Feldman-inspired solo piano work performed by Cory Smythe, a player who has come to occupy a central place in Sorey’s oeuvre. Smythe is similar in his ability to move between the classical and improvised music spheres and to destabilize the boundary between them. He knew Sorey as a drummer, but was surprised to see him live on piano one night long ago-so astonished, in fact, that he asked Sorey then and there for a lesson. “I would do that again if that experience played out today,” Smythe insists. “Tyshawn is brilliant and inscrutable to some extent,” Smythe muses, “and I revel in that mystery about him and his work. I think he does sort of delight in not being pinned down to any set of musical expectations. If you know his music from a few years ago, I don’t think you’d expect to hear some of what he’s writing now. He’s become more interested in some Romantic-era classical harmony, so there are bits of ‘Movement,’ from Alloy, that come off as almost Brahms-like. But even if he’s applying himself to that language he still does it in this idiosyncratic way.” On Inner Spectrum there are also episodes, for example “Movement IV” on disc two, where we hear a folkloric, almost dance-like melody-a result of Sorey’s deep affection for Ethiopian and Turkish music and the work of Béla Bartók. During a weeklong residency at the East Village avant-garde hub the Stone, coinciding with his birthday on July 8, Sorey reserved one night for a rare solo concert. He played it all: first piano, then drums, then trombone, interspersing archival recordings from the Yiddish Radio Project via laptop. As he accessed and played this out-of-left-field sequence of voices in Yiddish and English-a clip from Rabbi Reuben’s Court of the Air, another from C. Israel Lutsky, a.k.a. the Jewish Philosopher, to name just two-Sorey built something like an interactive sound installation, improvised and fleeting yet strong in form. Later he mentioned Fluxus, the Dada-influenced art movement of the ’60s and ’70s, as an inspiration. After a scintillating night with Mario Pavone’s trio, the final three Stone gigs showed Sorey in another light: not alone, but surrounded by a throng of musicians he calls the Banff/NYC Improvisers Orchestra, mostly students he’s taught at the Banff Summer Workshop. 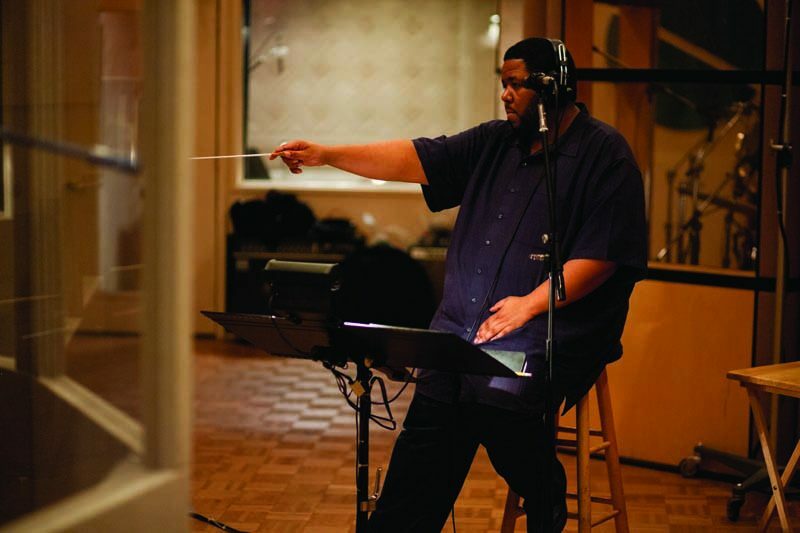 On the agenda was Conduction: a hybrid of Butch Morris’ system, Braxton’s system and Sorey’s own prompts.